The international humanist movement opposes the unjust order ofpolitical imprisonment of the ex-president of Brazil, Luis Inácio Lula da Silva. We oppose this hasty vote, manipulated by the Minister Carmem Lucia, pressured by the media and army generals who did not even follow the normal procedures of the process, simply to get Lula out of the 2018 electoral dispute. We are opposed to this anxious and hasty imprisonment that demonstrates the desperation of the Brazilian elites to seize the opportunity at all costs before the registration of candidacies is opened. It also demonstrates the failure of the elites, because they do not have viable candidates to defend their agenda of setbacks. We oppose the unusual accusation based on a power-point rictus and Moro’s confused sentence that orders the arrest for “conviction” without presenting a single concrete evidence. We oppose the media lynching led by the Globo TV network that misinforms, lying day and night to the entire population, manipulating the information at the service of the judicial coup and US interests. We oppose propaganda pieces disguised as movies and series supposedly based on real events, which aim to distort the facts to create a false historical account of the current moment, inciting hatred and confusing the population. We oppose the threats made by retired and active generals, who press for Lula’s imprisonment and who are silent on the impunity of Aécio, Temer, who silence the murder of Marielle Franco, rapporteur of the commission investigating and accompanying the military intervention in Rio de Janeiro. We oppose the arbitrary decisions of the exceptional court that was established in Curitiba through Lava Jato, which serves to feed the lies of the media, to persecute the political opponents of neoliberalism and the big national companies. We oppose the cooperation agreement between the departments of the United States of America and the promoters of Lava Jato, which investigate Brazilian companies to open the way for foreign multinationals to settle in the country. We oppose the decline of pensions and the decline of workers’ rights, the closure of schools and universities, the freeze for 20 years of public investment in Education, Health and Social Security that this coup-based government is doing in favor of banks and foreign multinationals. We oppose the incitement to political hatred against the poor, black and precarious population by using the discourse to fighting against drug trafficking, a process known as “Mexicanization” of Brazil. 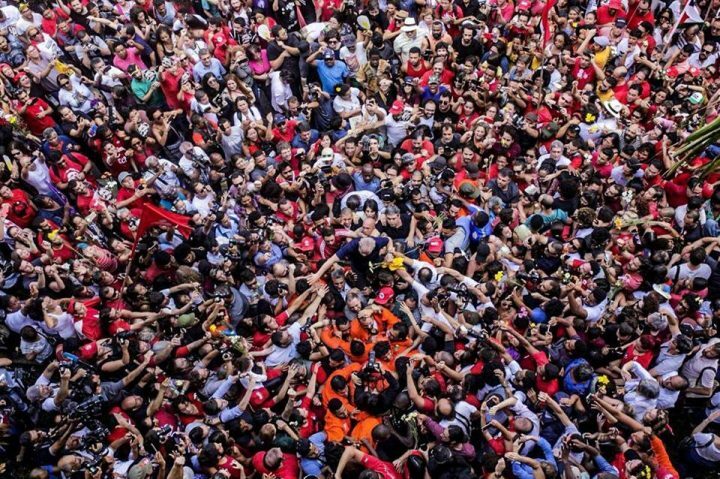 We oppose the breakdown of the Constitution of 88, and the interruption of elections to try to get Lula out of the political race by installing new electoral rules that will decrease campaign times from 90 to 45 days with the aim of reducing the political renewal of the national Parliament. We oppose the agreements with the coup sectors that can not be trusted, we do not have to believe that they will respect these new agreements if they have already betrayed all previous agreements. It is very naive to negotiate the delivery of Lula believing that they will respect the agreements. In order to change the current situation, a lot of popular pressure is necessary and we must learn to use the methodology of active non-violence in a massive and systematic way, demanding that the Constitution is minimally complied with and the rights of all are respected. No prison will enclose the heart, the ideas or the spirit of a person like Lula who, despite the many contradictions of his government, which we often criticized, does not deserve to be taken in the unfair and illegal manner in which he is being treated . At this moment we need to understand the current context and join forces in a broad front against fascism and authoritarianism, which prioritizes forming strong blocs in all parliaments and has a strong performance in the peripheries and also in the countryside. It is an obligation to resist an unjust prison. Those who failed to comply with the law are the ones who condemned without proof, and without abiding by the Constitution. When the decision is unjust it is necessary to disobey. As propostas do Partido Humanista partem da necessidade de liberdade que nós, seres humanos, experimentamos e suas propostas apontam à transformação e superação social da violência que, em suas distintas formas, gera sofrimento e contradição nos indivíduos e povos.